Rumbullion Non Vintage Rum is a popular Rum available from TheDrinkShop in 70cl to buy online. Visit TheDrinkShop for the best price for 70cl of Rumbullion Non Vintage Rum or compare prices on our other Rum products. Professor Cornelius Ampleforth has created an entire range of original and reimagined spirits inspired by by-gone eras and modern technology alike! Whether it's cold-compounding or distillation under vacuum, the madcap professor does whatever it takes to produce the finest libations and retain the freshness of the wonderful botanicals he uses. Rumbullion! is a cockle-warming spiced rum produced using the finest high proof Caribbean rum, creamy Madagascan vanilla and orange peel as well as cloves, cinnamon and a touch of cardamom. This fine sippin' rum is wrapped in brown paper and string, then wax-sealed by hand. 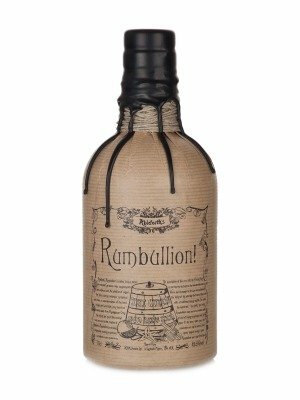 Where to buy Rumbullion Non Vintage Rum ? Rumbullion Non Vintage Rum Supermarkets & Stockists. You can buy Rumbullion Non Vintage Rum online in most retailers and find it in the Rum aisle in supermarkets but we found the best deals online for Rumbullion Non Vintage Rum in TheDrinkShop, Amazon.co.uk, DrinkSupermarket.com, and others. Compare the current price of Rumbullion Non Vintage Rum in 70cl size in the table of offers below. Simply click on the button to order Rumbullion Non Vintage Rum online now.